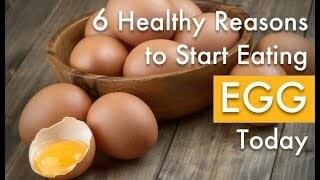 Egg is one the healthiest foods on earth proven by science today. Contrary to popular belief that they increase bad cholesterol levels, eggs have incredible health benefits so much so that many of the nutrients cannot be found in modern day diet. With their numerous benefits, eggs are nature’s perfect food. On top of everything, they are cheap, easy to prepare and blend with almost any food and taste amazing. Watch this video showing 6 healthy reasons that would force you to start eating this superfood today.